As the largest city in Pennsylvania, Philadelphia is a growing and bustling metropolis. Philadelphia is known for its rich history and tourist attractions including the Liberty Bell. Although steeped in the past, Philadelphia has no trouble keeping up with modern technology or industrial growth. To keep this cultural city alive with all its charm, construction and warehouse workers will always be a necessity. Many of these job positions require the handling of large equipment to access and accomplish certain tasks. 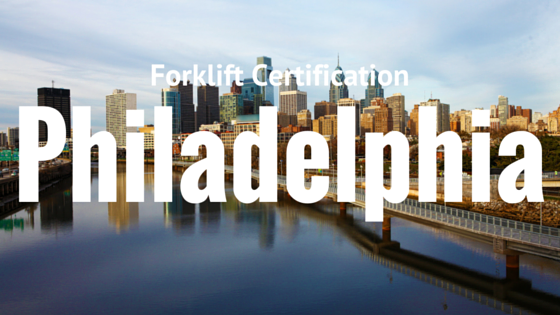 Obtaining a forklift certification is one of the best ways you can qualify for hundreds of jobs in Philadelphia, including forklift operator, warehouse driver and manager, forklift mechanic, and more. Although you may have experience operating a forklift, most employers look for certification to ensure employees are competent to handle heavy machinery, as to protect themselves from OSHA fines. Companies will no longer risk hiring uncertified workers because they can’t afford to be hit with thousands of dollars worth of fines. Not to mention, one of the most prominent reasons to obtain forklift certification in Philadelphia is to protect yourself from any harm on the worksite. Look for forklift certification that is OSHA compliant so you know you are getting all the information you need to protect yourself and other workers on a job site, and that you or your employer won’t face any fines or persecution. How Do I Find OSHA Compliant Forklift Certification? Forklift certification in Philadelphia is a crucial training to get, but that doesn’t mean it will require you to commit hours of your time or hundreds of dollars of your hard-earned money. Forklift training through CertifyMe.net offers Philadelphia workers OSHA compliant training that is the most convenient and affordable of certification programs. It’s also entirely online so you won’t need to travel to an off-site training facility. Once you take a few moments to sign up for the online course through the CertifyMe.net site, you will have instant access to the program, and you can access it wherever you have an internet connection. It also takes only about 1 hour to complete, so before you know it, you’ll have your forklift certification in hand, ready to show to employers. For $59.95, you can be equipped with the knowledge to operate a forklift properly, save yourself from injury or fatality, and give your employer the piece of mind knowing you are 100% OSHA compliant. Give Yourself a Pay Raise with Philadelphia Forklift Certification! Forklift certification is so much more than just a technical training—it opens the door to so many opportunities for workers in Philadelphia, including those of higher pay compared to jobs that don’t require forklift certification. And with CertifyMe.net’s training being so easy and affordable, why wouldn’t you take an hour to complete the forklift certification in Philadelphia you need to qualify for higher paying jobs? Sign up for the forklift operator course with CertifyMe.net today! Your future is waiting!